straight down towards the thru-hull. A couple of days ago our toilet plumbing signaled that it was time for the annual dismantling and cleaning of the system by springing a leak and spewing filth all over my foul weather jacket. Foul indeed. About once a year, not quite as predictable as the tides but just as inevitable, the plumbing succumbs to its own peculiar form of atherosclerosis, constricted by calcium deposits produced by the reaction between urine and seawater that I’ve seen reduce the diameter of flow to the size of a pencil. On the occasion of having completed this annual ritual, I thought I might say a few words about some of the less conventional features of our toilet plumbing, which may not be very romantic but could perhaps be useful. 1. No anti-siphon loop. Now, fitting the system with an anti-siphon or vented loop is generally considered critical (“it is absolutely essential,” says Nigel Calder, “to fit some form of a siphon break on both suction and discharge lines.”) But given how quickly calcium deposits form, I can’t imagine that they remain operable for very long. Therefore they only provide a false sense of security. Our response to the risk that the system might siphon water back into the boat has been to run the discharge line all the way to the cabin top and then down to the discharge thru-hull. 2. PVC pipe. Our discharge line consists almost entirely of PVC pipe, which is cheap, strong, easy to work with, and – most important – entirely odor-proof. 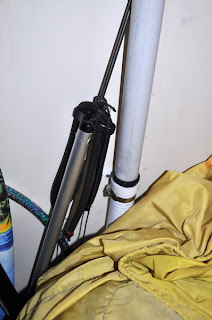 The last time I did major re-plumbing, I used some of the nice sanitation hose purchased at great expense from the local chandlery, but right from the outset the stench permeating the hose was enough to drive me off the boat (this problem was made worse in our case because we run the line quite long in order to create a high loop). We were told that the only way to deal with the odor would be to invest in the even more expensive hose, which needed to be imported from the USA and even before it left the States would run us something like $85 a meter (in our case we were looking at $500 worth of hose – even more by the time we got our hands on it in New Zealand). But the fact is that standard household PVC pipe does the trick exceptionally well for a fraction of the price. The limiting factor is that the pipe is rigid and exposed to the (very minimal) risk of cracking. I suppose it’s possible to smash it by throwing an anchor on it, but there’s not much room for a wind up. 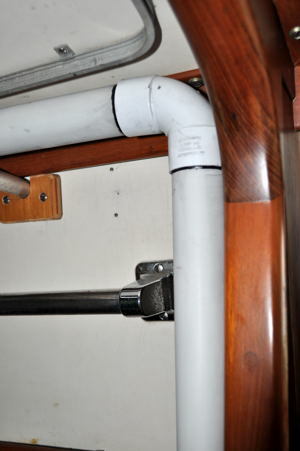 Nonetheless, we use a short length of hose between the toilet and the piping and another length of hose that connects with the pipe just above the waterline and goes to the discharge thru-hull. 3. DOW 795. I love the stuff. It’s pretty much the only sealant I use. It’s a non-acetic silicone (doesn’t have the typical vinegar smell of most silicones) designed for glazing high rise buildings, for example. It is very elastic, adheres well to plastics (i.e., plexiglass and PVC), quite forgiving (in terms of application procedures), cleans up easily with mineral spirits (even years later), and keeps almost indefinitely in the tube after it’s been opened. Here I used it on all of the joints and to assemble the PVC piping. 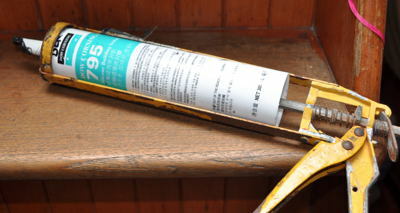 Now, it’s not much of an adhesive, which means that the PVC piping can come apart. Indeed, the reason the pipe sprung a leak was that the pressure due to the clogged system forced one of the joints apart. But while that is messy, it’s a better alternative than breaking something in the toilet. Also, unless you can take the PVC apart, there is basically no way to clean it out. This might not matter very much if there’s a building supply store down the road, but it could pose quite a problem if you’re anchored at Minerva reef. Since the PVC connections aren’t permanent, however, this makes the length of hose between the discharge thru-hull and the PVC connection above the waterline all the more important. While there is the risk of a mess, there’s no risk of sinking the boat.